FOR A VACATION YOUR FAMILY WILL NEVER FORGET! 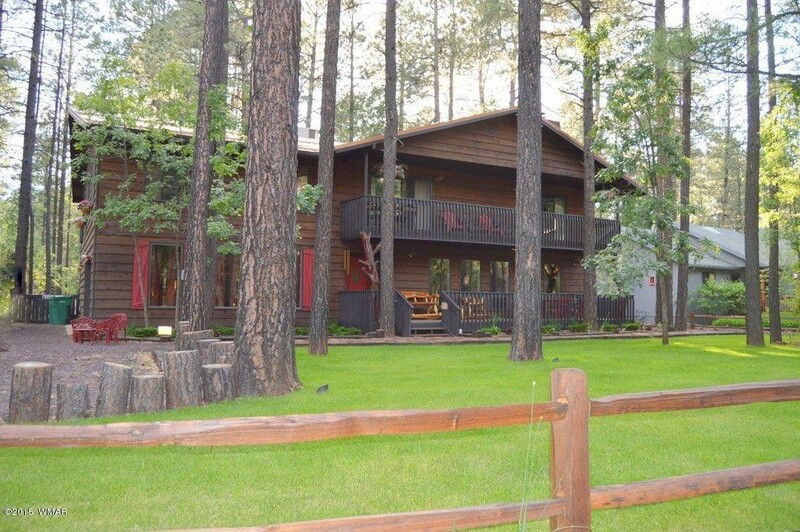 Whether you choose to spend a weekend, enjoy a weeklong getaway or plan to create holiday memories, Kobey’s Ski Lodge and Golf Retreat is the perfect Arizona cabin rental – tucked within the tall pine trees creates a spectacular backdrop of the Sitgreaves and Apache National Forests within the exclusive Pinetop Lakes Country Club. 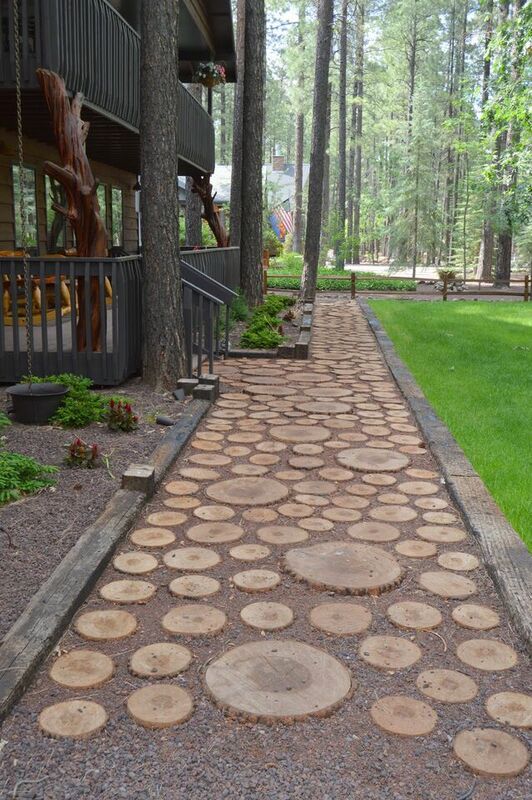 A short, scenic drive North East of Phoenix, Pinetop is a year-round favorite among travelers from all over the globe. The comfort of this private mountain cabin can accommodate 28 individuals with space to settle into 4500 square feet of mountain bliss complete with private balconies from each of the 6 bedrooms and boasts 4 bathrooms to accommodate any family or company retreat. A large kitchen equipped with stainless steel appliances, granite counters, custom cabinets and all the amenities to cook a gourmet meal allows for guests to mingle and space to entertain on the outdoor decks where kids and pets can frolic and play within the fenced private yards. 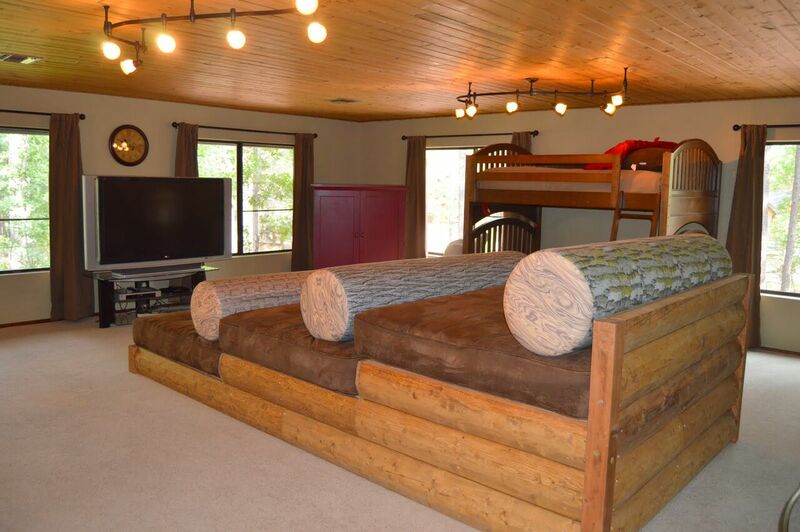 After a long day on the slopes or a round of golf, its time to chitter and chatter beside the family fireplaces or chalk up cue sticks for a game of pool in the 500 square foot Super Cozy Fun Family Game Room, complete with pool table, comfy lounge couches and games for all ages. As the day unfolds and evening sets, guests can meander up to the Tree House theatre to watch their favorite flicks on the 50” flat screen TV while cozying up on the custom made theater beds designed for the ultimate lounging experience like no other. No need to worry about getting chilly as the fireplace sets the stage for warmth and ultimate comfort. With so much to offer Kobey’s Ski Lodge and Golf Retreat offers a unique and unrivaled experience for the perfect getaway. There truly is not another cabin that can match the amenities of the most distinctive cabin rental in the White Mountains. Our family owned and operated rental management company consistently ranks in the top vacation rentals for unparalleled service and amenities.We treat our guests like family and truly care about providing not only a vacation property, but creating a memorable experience that will last a lifetime! 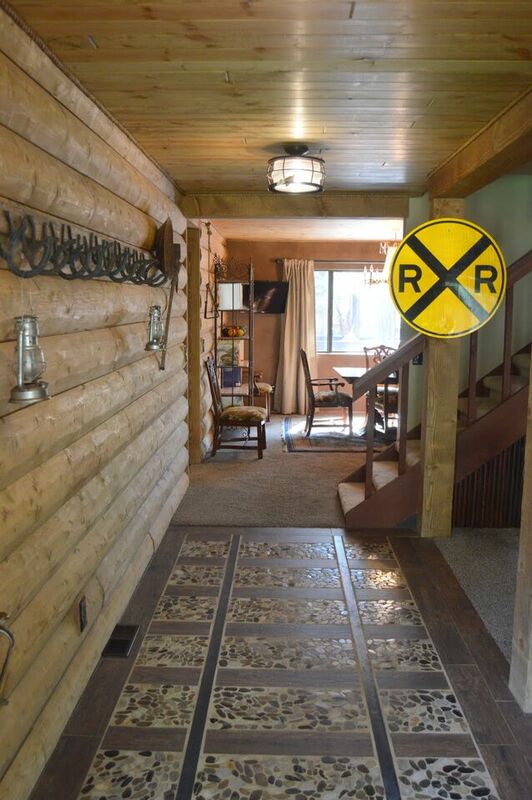 And if you need another cabin, check out our Kobey’s Cozy Cabin (Sleeps 7-14) just a couple minute walk from Kobey’s Ski Lodge and Golf Retreat. Everyone can watch a movie in our Tree House Theater with its 65″ High Def TV while sleeping 14 people all in one huge and ever so cozy room with our custom made for this cabin Triple Stair-Step Theater Beds (sleeps 6), 2 Four Person Full/Full Bunk Beds (Sleeps 8) and a beautiful 360 degree tree top view of the forest including a wonderful large covered balcony& Gas Fireplace w/ Remote. Every bedroom has a door to its own covered balcony with a view & high definition SMART TVs with Premium Cable. Other upstairs bedrooms consist of the Master with a King and a trundle (Sleeps 4), and our TWO large Tree Top bedrooms each with 2 queens per room (Sleeps 8). And on the main floor we have our Mama &Papa’s Bedroom with a SUPER COMFY Four Poster Queen Canopy bed (Sleeps 2) and its own bathroom right next door.Every room in this Arizona cabin rental is generously large and has it’s own private balcony with gorgeous views of the tall pines. 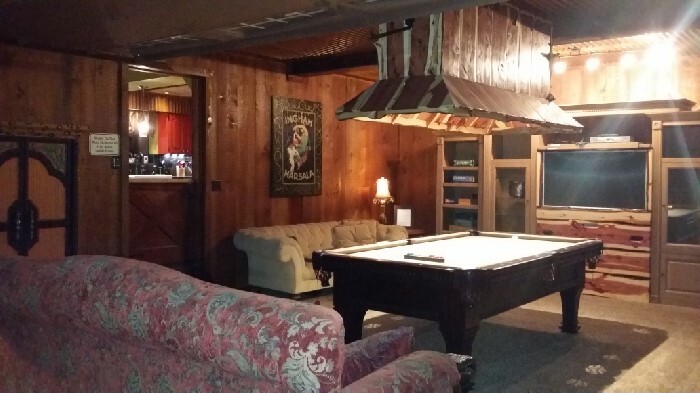 The Lodge is a spectacular experience from the get go, as the entrance resembles entering into a Mine Shaft.What used to be the garage has now been converted to our Climate Controlled Super Cozy Fun Family Game Room with pool table, sofas, tv, and other fun games for the family. If you can set down your fishing pole long enough to check your email, you will be pleased to know The Lodge offers FREE secure high speed wireless internet for your convenience. -First, the downstairs great room with a sea of super comfy sofas, a 50″ high definition flat screen TV, Huge Gas Fireplace w/remote control & No Mess To Clean Up! -Second, watch movies with 14 of your favorite people in the Tree Top Theatre and then all fall asleep right there in your custom made theater bed, and another wonderful Gas Fireplace w/remote control. -Fourth, another great gathering spotis of course our Kitchen, BBQ Deck, Breakfast Bar and Antique Island: Enjoy a chef’s dream kitchen with room for multiple cooks to put out a delicious spread. 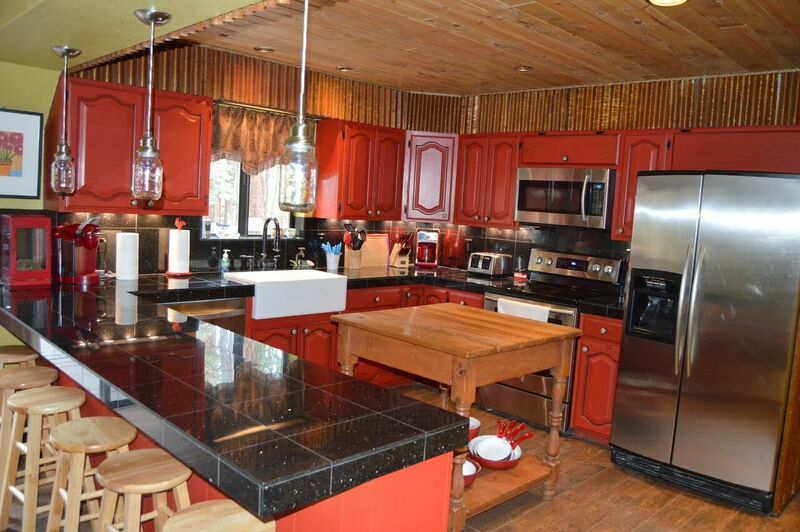 It is fully equipped with stainless appliances- a Convection Oven, Top of the line Copper Pots, Granite Counters, Large Farm Sink within a whimsical McKenzie Childs decor & everything you’ll ever need for the perfect family feast!All utensils and cookware that you would need are provided. 2 large gas BBQ’s are situated on the spacious backyard deck conveniently located off the kitchen. Whether you are cooking for a small army or just the intimate family, we’ve got you covered! 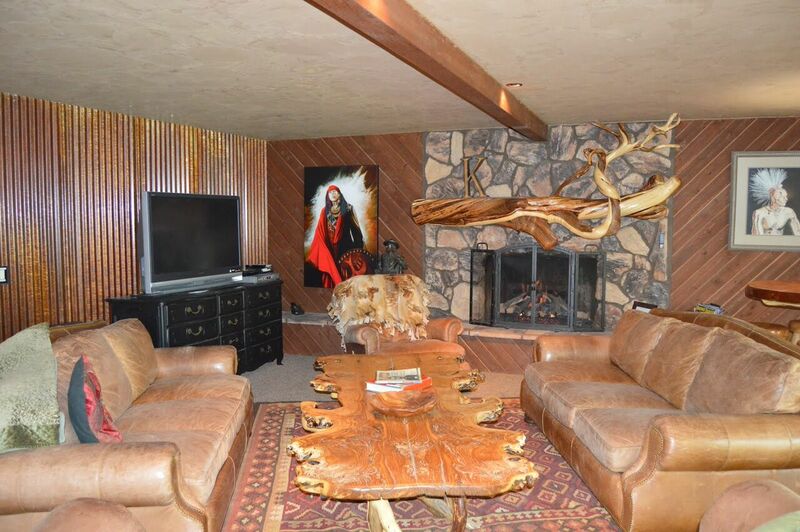 This really is a one of a kind Arizona cabin rental! Poster Queen Canopy Bed with its own spa like bathroom #1. Stainless appliances, Copper Pots, Granite Counters, HUGE Farm Sink, Convection Oven: Everything you’ll need for a wonderful family meal! Pinetop Lakes REC CENTER w/ Pool & Spa, Tennis Courts & Gym, Racquet Ball, Pool Tables & Ping Pong& many scheduled fun activities throughout the year for adults and kids. Amenities: 2 Gas Fireplaces, Fenced Front & Back Yards, High Definition Flat Screen SMART TVs w/ Premium Cable in every room, 4 w/ DVRs, Telephone, Very Comfortable Linens w/ plenty of blankets & pillows for everyone, 4 Large Covered Balconies w/ Forest Views, Fully EquippedKitchen, Stainless Appliances, Convection Oven, Microwave, Dishwasher, Refrigerator, Laundry Room with Washer &Dryer, Ironing Board, 2 Large Gas Grills, Cooking Utensils, Plush Towels, FREE High Speed Wireless Internet, Theater, Game Room, Pool Table, 6 Oversized Sofas, 2 Large Dining Room Tables, ExtraBuffet Tables& Chairs, plus so much more… Just don’t forget your toothbrush! DARBI’S CAFÉ – 4 Miles away: There’s nothing like it up there! Snow Skiing: We are about 20 minutes from Sunrise Ski Resort, depending on the conditions of the roads. 20 Minutes Away: HAWLEY LAKE (Guy’s Favorite) -260 Acre BREATHTAKING Lake Stocked with Trout & Electric Motor Fishing Boats for Rent & Store. 45 Minutes Away: RESERVATION LAKE (Mt Baldy/ 11,500?) – Somewhat of a bumpy dirt road, but It’s God’s Country! Stocked with Trout & Electric Motor Fishing Boats for Rent & Store. Please View My Short Informational Video Including Sound Vacation Rental Advice From Me, Your Go To Guy When It Comes To Arizona Cabin Rentals! CANCELLATIONS: If you cancel 365 days or more before your arrival date, you will be refunded the money you paid minus a $250 processing and marketing fee. There will be no refunds for cancellations within 365 days of your arrival date, including early check outs, no-shows, or stays shortened or prevented due to inclement weather. Travel insurance can be purchased and is highly recommended. For Travel Insurance please see email with attached information, ask for further information, or contact your preferred insurer. HOLIDAY & SPECIAL EVENT RATES ARE HIGHER!